After years of building a replica of the Vickers F.B.27 Vimy and months of testing the new flying machine, the Vimy team was ready to reenact the first of the three landmark flights. On September 11, 1994, Peter McMillan and Lang Kidby took off from England in their G-EAOU, accompanied by National Geographic photographer Jim Stanfield and engineer Dan Nelson. Despite the advances in navigation since the Smith brothers’ flight and the team’s extensive preparation, they had had reason to feel nervous about their journey. Some hazards, such as severe weather, navigation through unfamiliar territory, and the potential for mechanical problems, were not much different from those encountered 75 years earlier. During the initial legs of the flight, over the English Channel and into France, Peter and Lang grew accustomed to handling the Vimy through storms and over mountains, good practice for arriving in Pisa, Italy, in time for a freak hurricane. In winds that reached 80 miles per hour, the crew struggled to taxi the plane into a hangar. When the storm lifted, they circled the Leaning Tower and headed south through Italy. After stopping in Crete, Peter and Lang crossed the Mediterranean, struggling to keep the Vimy, with her full fuel load, aloft in the sweltering air on the way to Egypt. 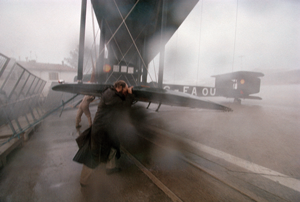 The crew tried to hold the Vimy down during a hurricane in Pisa, Italy. Courtesy of National Geographic Society. Unlike the 1919 Australian team, Peter and Lang had to devote hours to planning routes that skirted restricted areas of the Middle East. Deviating from the 1919 flight path, they avoided Syria, Iraq, and Iran and instead flew through Saudi Arabia to Bahrain. Reaching Karachi, Pakistan, was trouble free, but border conflicts temporarily prevented the Vimy from crossing into India. Due to an outbreak of the plague in India, Myanmar denied permission to enter the country. Defying the authorities, Peter and Lang turned off the Vimy’s radio and landed in Yangon anyway. The crew was relieved to reach Bangkok, Thailand, but the jubilance was short-lived. As Peter and Lang flew across the Malay Peninsula, the right engine developed an uncontrollable oscillation, which forced an unscheduled stop. The Vimy sounded better after the spark plugs and other parts were changed. The improvement was only temporary, however. Over Sumatra, dense smoke from slash and burn fires forced Peter and Lang to fly only 200 feet above the jungle so they could see the ground. Even worse, the right engine acted up again, then stopped completely. The Vimy was unable to maintain height on one engine, and Peter and Lang looked frantically for a place to land. They finally brought the plane down in a rice field, just hundreds miles from where the original G-EAOU sunk in the mud. The circumstances were uncannily similar to the situation confronted by the Smith brothers. The replica’s crash landing seemed to spell the end of the project. 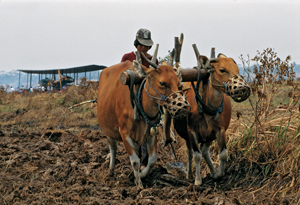 Lang saw the situation differently and, within a few days, organized the local farmers to help construct an airfield. A new engine and other parts were flown in on a twin-engine plane lent by the Australian Army. Six days after the crew faced disaster, the Vimy was again on its way to Australia. Villagers helped clear the crash site in Sumatra and improvise a runway. Courtesy of National Geographic Society. The last legs were challenging, as the Vimy successfully overcame rugged volcanic terrain, long water crossings, constant headwinds, and persistent turbulence. With Lang at the controls, the Vimy crossed the Timor Sea and touched down in Darwin on October 22. No cash prize awaited the crew, but they were overjoyed to realize their dream. A few years later, they were ready to plan their next flight—taking the replica Vimy from England to South Africa.